On Thursday July 19, 2007, 3 year-old Harrison Leonardo finally lost his fight with Leukemia. Please make checks payable to "Harrison Padua Leonardo Memorial Fund, Account #100314.S1.1"
There is still time and hope to help others suffering from these rare blood diseases. 6 month-old Elyse Yu still has a fighting chance. She has begun chemotherapy while she desperately awaits a bone marrow donor. So far Elyse's family and friends have registered nearly 2,000 new donors. Donation drives continue in the Southern California area and across the nation. Please register and get the word out if you haven't already. I hope and pray they find a donor for her soon. Visit Elyse's web site for more about her story and how you can help. My heart goes out to Danny Takemoto and those who have suffered similar tragedies. 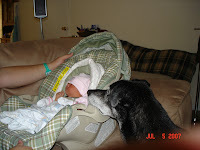 Earlier this week, Parent Wonder published 101 Child Safety and Childproofing Tips for Parents. It's definitely a great resource on what we can do to keep our children safe and sound. It's also an excellent reminder that child safety is an ongoing and never ending process. The lead story in a lot of Bay Area papers today concerns the death of a 11-month old boy, left in a car while the father went to work. The father, 46-year-old Danny Takemoto of Benicia, left home early Tuesday with his son strapped into a child seat, according to Concord police Lt. David Chilimidos. The man did not stop at the child care center and went directly to his office at a medical equipment company at 4040 Nelson Ave., parking his car, a blue Honda sedan, in the lot near the office. His wife phoned him at work shortly before 3:30 p.m. to ask why the child care facility had called her to report that her son was not there. In horror, Takemoto raced outside to the car and found the lifeless body of his son still strapped in the car seat, Chilimidos said. It's heartbreaking to think of the scene that unrolled when he discovered his fatal error. Takemoto is being charged with suspicion of involuntary manslaughter. What do you think? Should the guy get punished? UPDATE: The father won't be charged. One of the first musical purchases we made after Mase Marvelous was born was Songs From the Street: 35 Years of Music from Sesame Street. It was fun to listen to all the old tunes that kept us 40 year olds stuck in front of the TV. I distinctly remember songs like "Rubber Ducky," "C is for Cookie," "Mnah Mnah" and all that. I found myself digging ones I had totally forgotten. But now that he just turned two — and working the FF/RW buttons to get to his favorites — we're so over it now. He's big on Elmo, too, so the novelty of the boxset is gone. Evaporated. It's become background music. In fact, if we have to hear Big Bird do his freaking "Ab-cdef-ghijkl-mnop-qrstuvxyz" thing one more time, I'm gonna lose my Mnah Mnah Mind. But sometimes, when Mace is playing contentedly and humming the songs to himself or starting to dance, I think the boxset was the best investment. It doesn't drive me half as crazy as something like the other mass marketed kids musics (Winnie the Pooh, you are the scourge of my long-term memory). And I begin to listen again. Grover, for example, was the cameo king back in the day. He was the monster version of Busta Rhymes. Maybe it's ennui that draws me back, but after watching those three vids (all songs are on the boxset) I wish they made kid's music this cool today! Anybody else go through a love/hate/love relationship with Sesame Street? My son, Penguin, has been scratching himself since his third or fourth week of life. Medically, he has been diagnosed with eczema like many Asian American children and especially Pilipino kids according to this study. It is not extreme but annoying, and we feel for him when he scratches off the top layer of his skin like its a lottery quick pick or scratches as if he has fleas. I think we've put an industrial sized vat of Aquaphor and Eucerin on him by now. At the risk of exposing my complete medical ignorance to the doctors on this blog, the conspiracy theorist in me believes his condition (the fact more Pilipinos like his uncle get eczema) raises the larger issue of differentiated health care based on race. For geneticists, race is more than skin deep (although unclear as to how much and what.) Life expectancy and mortality rates still have significant differences according to race, and I don't think it is simply based on socioeconomic differences (although gender is a bigger factor.) When I did large scale opinion studies on issues that were related to race, we would have to significantly oversample for each racial demographic to have a valid statistically significant sample of particular races. The results of medical studies are assumed generalizable to all populations, but is that always the case, have they oversampled for different races or other subpopulations? Personally, I've been amazed to know of middle class and affluent African Americans dying of seemingly "natural causes" at a relatively young age, and I'm not talking about sickle cell anemia. What medical work is being done on race-specific ailments or effects of medication? Just wanted to take a second (while I still have one) to thank everyone for the kind words. This has been the most amazing week and a half of my life. This whole process has made me a better person, and cliche as it might sound, more in love with my wife. So far, it's been intimidating and overwhelming as hell, but it's also been tons of fun. I hear it only gets better. Can't wait! By the way, I think the dog's in love. Sunshine: Daddy, the movies from Chinatown don't look so great in the home theater. SoulSnax: Fine, what movie do you want? I'll see if someone at work has it, and I'll make a copy for you. Sunshine: Why can't we just buy it at Blockbuster? SoulSnax: Honey, if we just went and bought it at Blockbuster, then we'd be giving our hard-earned money to the pseudoliberal Hollywood hypocrites who robbed your uncle Roy out of a career. As many of you may know, two of my greatest passions in life are (1) being a proud Asian-American man, and (2) baseball. So naturally, it should come as no surprise that several years ago, I decided to start my own Asian Baseball Hall of Fame in my apartment. Over the years, I (and my devotedly understanding wife) have been spending my daughter's future inheritance on amassing a collection of rare autographed baseballs and cards from Asian baseball players. I'm especially proud of my collection of items signed by Masanori Murakami. Many Asian-Americans tend to believe that the appearance of Asian baseball players in the Major Leagues is a recent phenomenon. However, back in 1964, Murakami came over from Japan to be a star relief pitcher for the San Francisco Giants. Unfortunately, due to a contract imbroglio, Murakami went back to Japan a year later. The other highlight of my collection is based around Ichiro Suzuki, the current Seattle Mariner of Japanese descent who quite likely will end up in the Hall of Fame as one of the greatest players the game has ever seen. Period! In last night's MLB All-Star game, Ichiro had the performance of a lifetime. He went 3-3, hit a 2-run homer, and was named the games Most Valuable Player. Needless to say, all over the world, Asian and Asian-American hearts swelled with pride. In a way, the fact that many of us were so overjoyed to see Ichiro perform brilliantly on a national stage is partly why I originally decided to pursue my own personal Asian Hall of Fame. In my mind, I'm creating this collection as a legacy for my daughter. Despite her inevitable assimilation into mainstream "American" culture, I want her to always be proud of her Asian heritage. I want her to have Asian heroes (and heroines) that she can always look up to. And I want her to see that if she looks hard enough, she can find inspiration from Asians in many venues...sports, art, literature, music. Anything! But more than anything else, I think I've chosen this particular method of honoring Asian sports heroes as a way of battling mainstream media's portrayal of the emasculated Asian man. Not only do I want her to look at her father as a severe rebuttal to this sadly infuriating image but also I want her to see (in her own living room!) that many more examples exist. What do you think? Am I a little nuts? Do any of you do anything similar? How do YOU help instill a sense of "Asian pride" in your children? 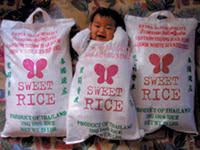 Is my baby NOT a RiceBaby?? The baby just turned six months old, and my wife wanted to commemorate the milestone by feeding her rice cereal. Unfortunately, she's been having diarrhea all week, and is developing a really raw diaper rash from pooping about ten times a day. I'm wondering if that's just a natural part of adjusting to new foods. The doctors speculate that she may be allergic to the cereal, and instructed us to hold off on the cereal for now. Who would have thunk it, an Asian kid allergic to rice!!! P.S. : I meant to plug the creator of that image above. In case you didn't already know, it's from our friends over at Great ExpectAsians, an "online greeting cards store designed to showcase and foster positive images of Asian Americans." Use them for all your special occasions. Warning, this post has absolutely nothing to do with parenting. Or race. Music, a little. So, I mentioned on ricedaddies radio that for Father's Day I got myself a ukulele. I have progressed from being completely clueless to knowing the requisite three chords (C, F, Gminor). For my birthday recently, Mrs. Thisislarry got me a Jake Shimabukuro CD. Shimabukuro is a mighty, mighty ukulele master. Wow. But that's not the point. The point is I googled "Jake Ukulele" to find out more about this guy, and the second link to pop up was this article from the San Jose Metro. Look familiar to anyone out there in RD land? Daniel: We can definitely crack this. Remember I was a kid once too. Come on - it's someone at school right? Daniel: And what does she feel about you? Daniel: Good. Good. Well, basically. . . you're fucked aren't you? Fast forward to a few years ago when Number One Monster tells me he likes this girl in Pre-K so I'm feeling deja vu. Now I thought to myself, do I want to be the type of daddy whose sons would come to him for dating advice? Do I even want them thinking about dating at this age? Ah hell, will this old man even be able to give the right advice?! Unfortunately, we all know that the image of Asian American men suffers from discriminatory bias in the media so these questions are even more pertinent. Me: Son, you remember I told you to always tell the truth? Me: Well... there are certain exceptions. Me: So son [pointing to really fat lady on TV], is that girl fat? Son: Nope, but you are! Me: Son, you know you have to treat all your friends as special. Me: But you have to treat your girlfriend extra special. Son: Why do you have to treat her extra special? Me: Because if you don't, she won't be your girlfriend any longer. "Expecting" Rice Daddy, no more! Woman in Robe: "He looks Hispanic, or um um um (searching for the right word)..."
Woman in Robe: "....part Filipino, or Korean..."
Woman in Robe: "..but he looks like a NORMAL baby." Me: WTF?? Oh HELLS NO. What would you have done? I thought it gauche to interrupt an A-B convo to yell at her ("What the hell is 'Normal' you racist, privileged beeatch?!") especially when I'm supposed to be relaxing. I dislike when strangers overhear my convos and feel the need to pipe in. I took it as a good reminder that some people still visualize 'normalcy' as not what your baby looks like. And that same day, Maceo came down with Roseola. Sometimes ya just can't win. Thanks for being there for me, America!!! To celebrate your birthday, I'm investing in your future. Here's to another 231 years! Filipina Moms join the AsAm parentblogging party! Last week saw the public launch of a new group blog by a diverse group of eponymous Filipina Moms, spearheaded by Chicago-based SugarMama, who also writes for Chicago Moms Blog. Their crew of Pinay blogmamas includes regular Rice Daddies commenter MamaZilla and, I'm pleased to announce, a newbie to the "post" side of the blogosphere (vs. the "comment" side), who goes by the handle "la dra." Yes, that la dra., my charming, beautiful and talented partner. She's even set up a solo blog, whose name is a riff of off my own nom de blog that our dear friend Superha came up with long ago. I'm so happy that now she has not just one but two places to blog (to pick up the slack from her deliquent husband). So go check 'em both out and give all our Pinay sistas some love! Oh, and before I forget, thanks to your generosity, we have now fully funded all three of our originally chosen projects in our Rice Daddies Empowerment in Diversity Challenge via Donors Choose! As our philanthropist-in-chief SoulSnax wrote earlier, we've already added a new project to our list, and there are plenty more where that came from. Tomorrow is the last day for you to take advantage of InstantYang's generous dollar-for-dollar matching challenge, so celebrate our nation's birthday by doing your bit to help make this place live up to its promises for all our children.